I’m back! After a crazy last few weeks of classes and a great Christmas break I’m bringing you the perfect recipe for the crazy cold weather. 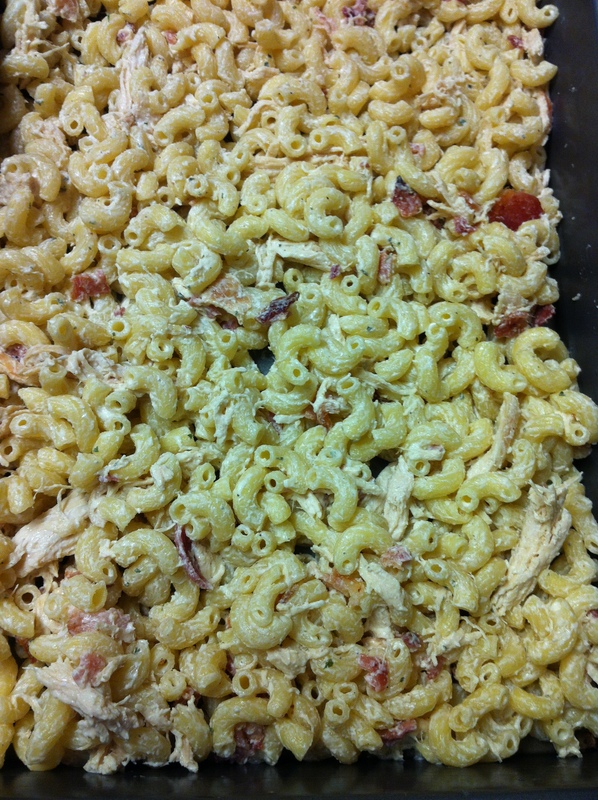 Prepare yourselves for Chicken Bacon Ranch Macaroni and Cheese. Yes folks, it’s as wonderful as it sounds! 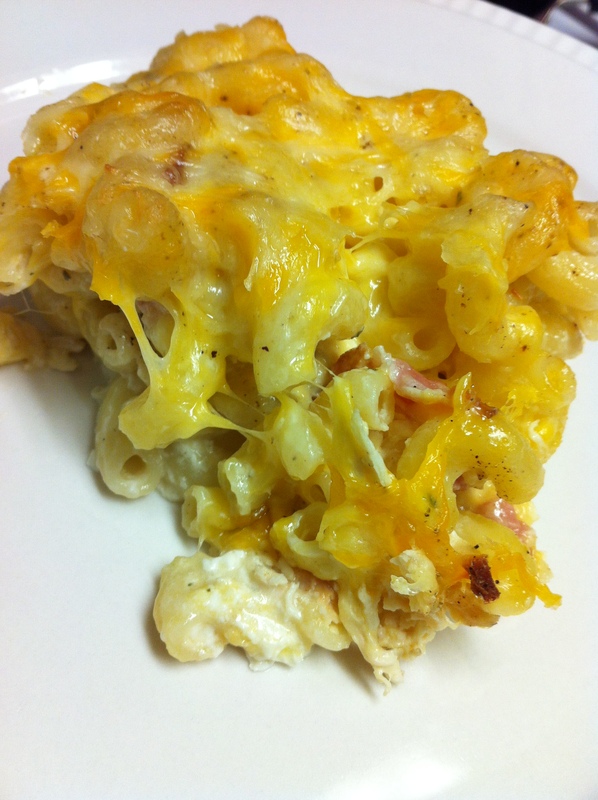 A few weeks ago FoodPorn tweeted a photo of Chicken Bacon Ranch Macaroni and Cheese so I googled recipes and came across this one from Of The Hearth. It kind of reminded me of my nanny’s baked macaroni and cheese which is my absolute all time favorite food ever so I decided to use that recipe as a base, it turned out fantastically! First cook some bacon and crumble it when it’s cool. 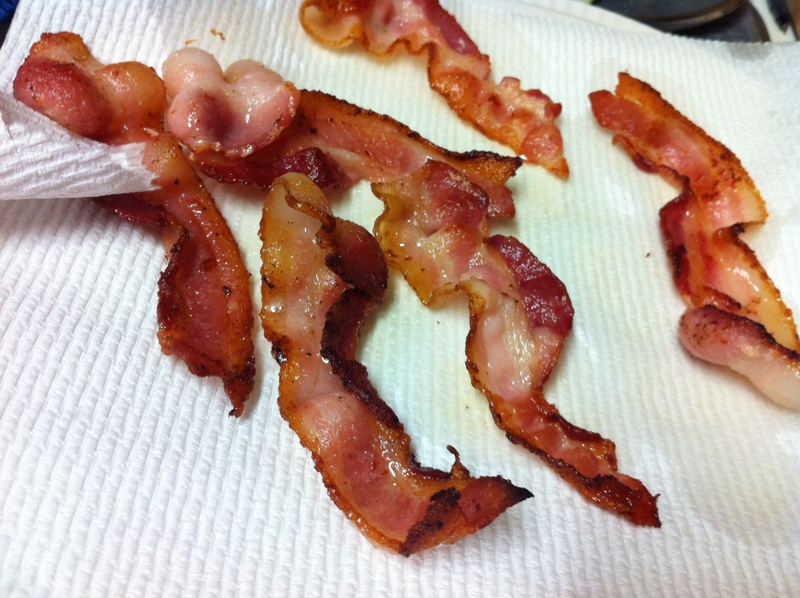 No recipe can be bad if it starts with bacon, that’s a scientific fact. Then cook some chicken. After it’s done shred it up. While your chicken cooks boil some water and cook a box of macaroni according to the directions on the package. 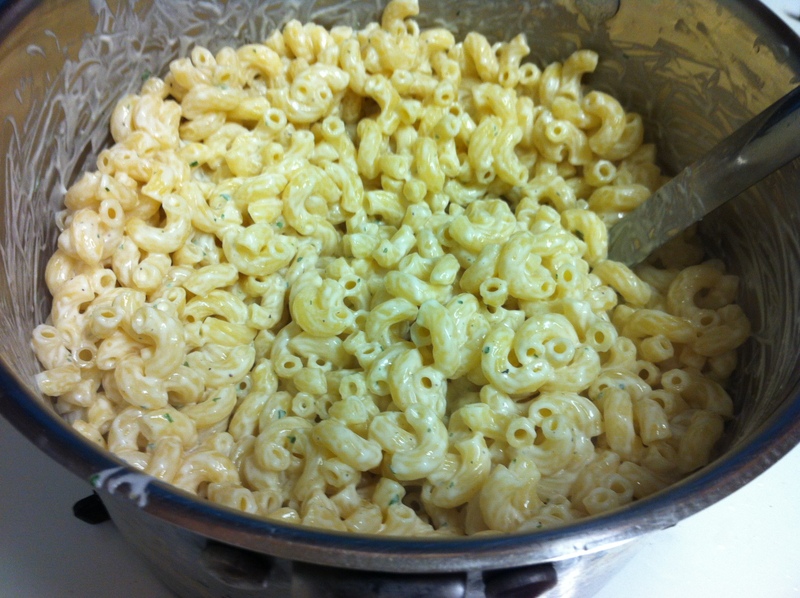 After it cooks drain the macaroni, return it to the pan, and stir in sour cream and ranch seasoning. 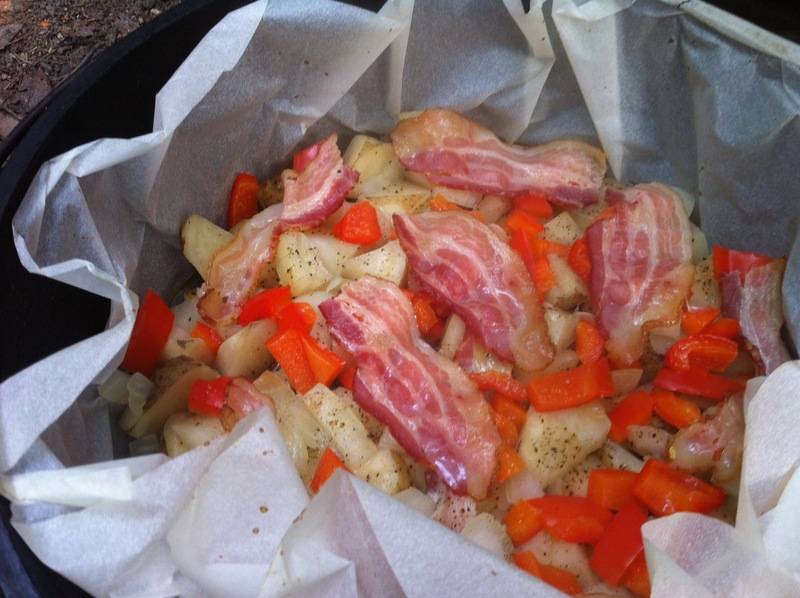 Then mix in the bacon and chicken. Put half of the macaroni into a buttered pan and top it with shredded cheese and pepper (you can add salt too if you like but in my opinion the ranch seasoning mix is salty enough). 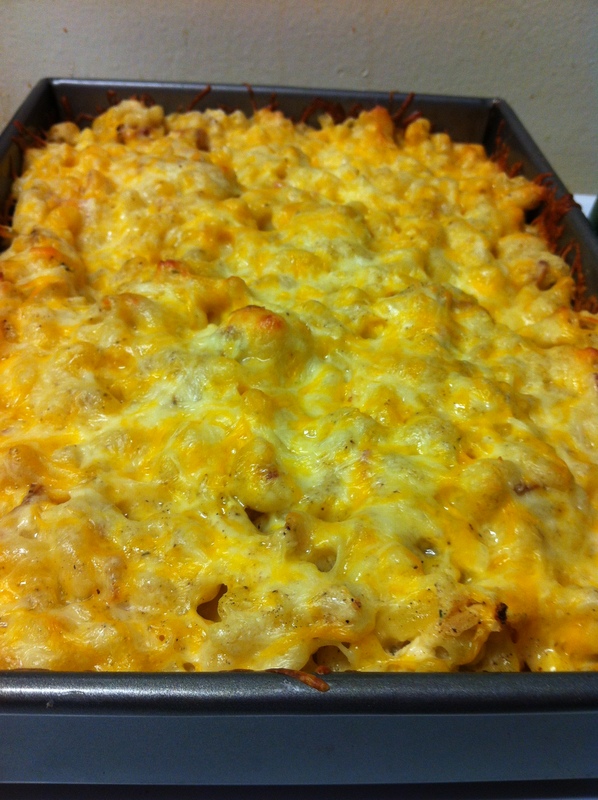 Repeat with another layer of macaroni and cheese. Pour some milk over the macaroni. 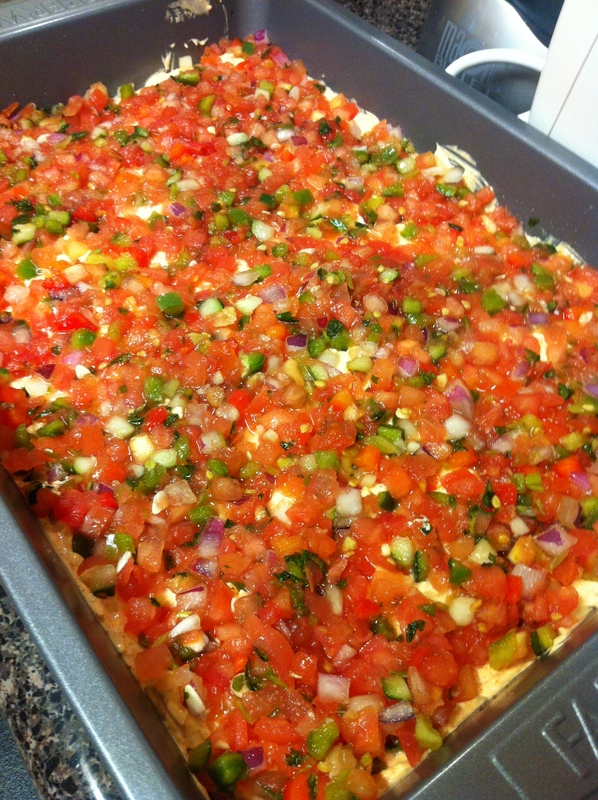 Place the pan in the oven and bake until the cheese is browned and bubbly. Serve up the deliciousness!!!!! 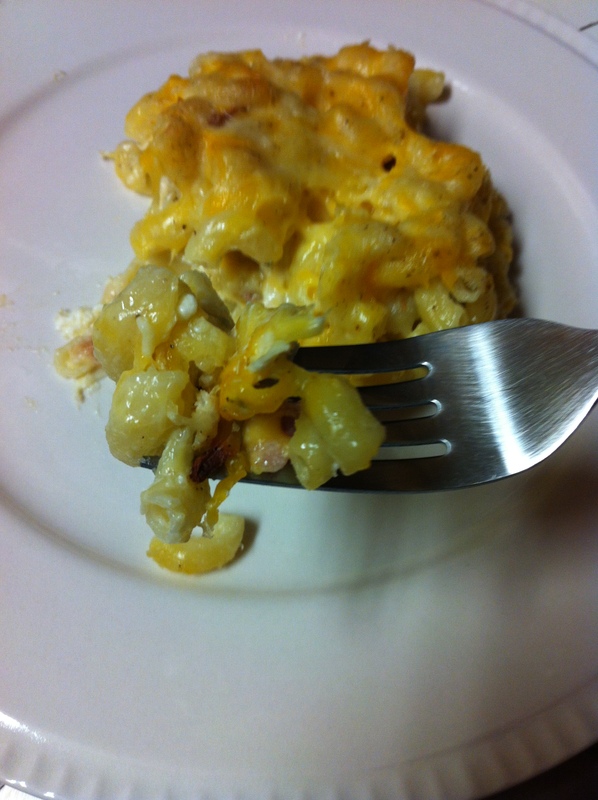 I kid you not, this mac and cheese is a cheesy, ranch mac and cheese with delectable bits of bacon and chicken, yummmmmmmm! Who doesn’t love pizza? No one, right (at least no sane person…)? I love making pizzas at home so I can put on whatever toppings I like. 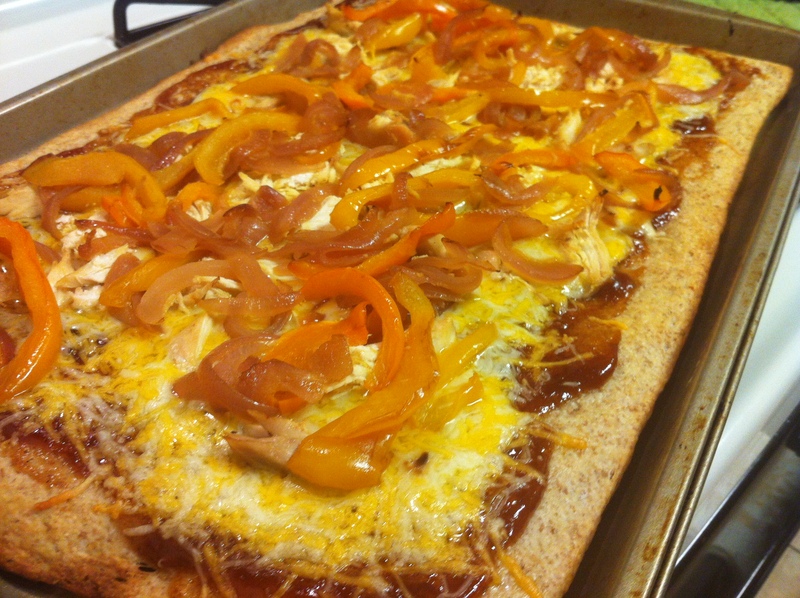 Plus it is super quick and simple to make pizza at home! 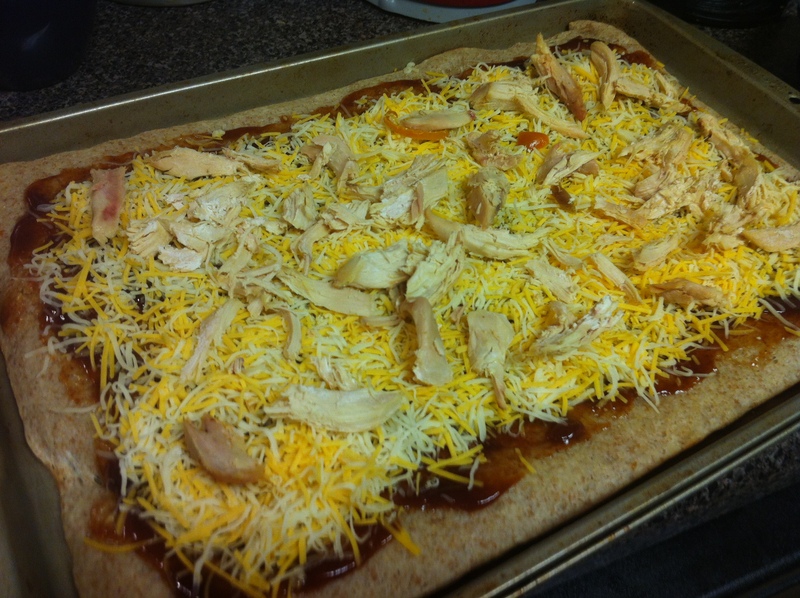 This past week my friends and I got to together to study for an exam and decided to make BBQ Chicken Pizza for dinner (because no study party is complete without food). 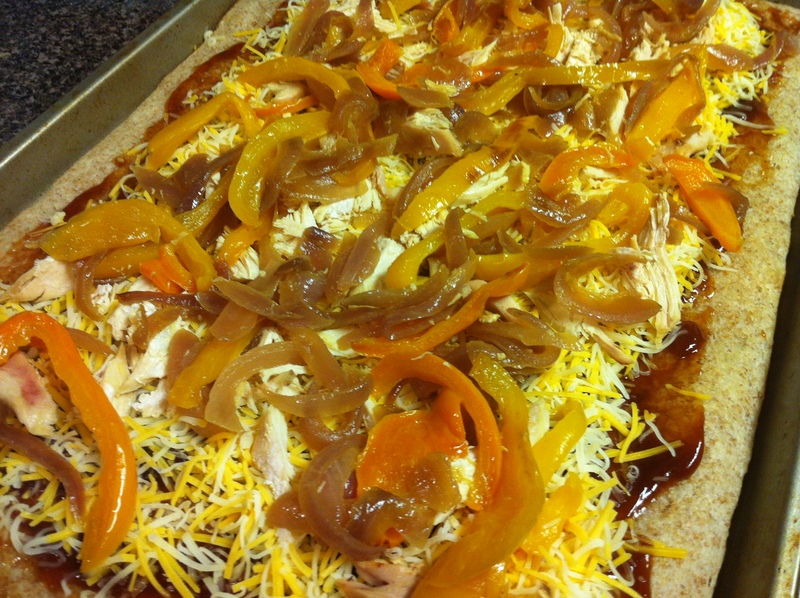 I buy refrigerator pizza crust (the Pillsbury kind from the pull apart can) and then top with sauce, cheese, and toppings as suits my mood, for the BBQ chicken pizza we went with BBQ sauce, Mexican shredded cheese, sauteed peppers and onions, and shredded chicken, yummm! 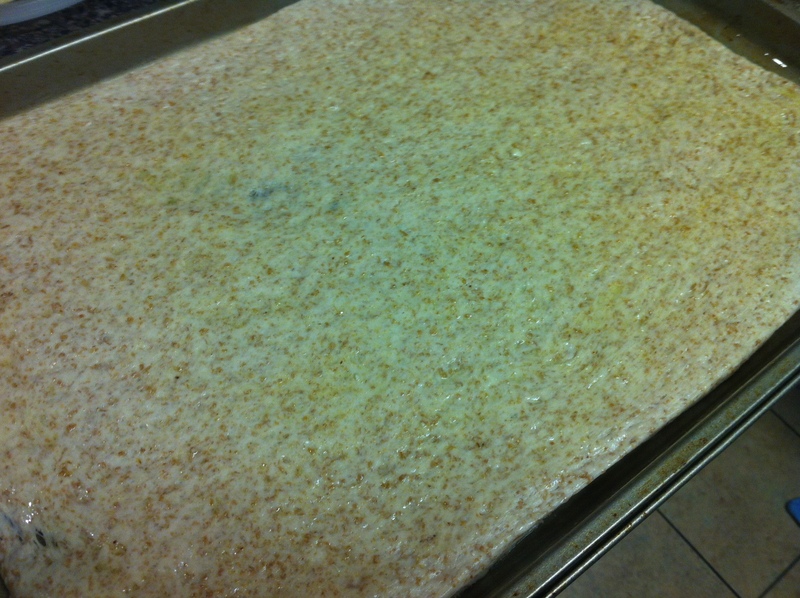 First spread the dough onto a greased baking sheet and top with some olive oil and garlic powder and then toss it in the oven. Saute some red onions and bell peppers until they’re softened. 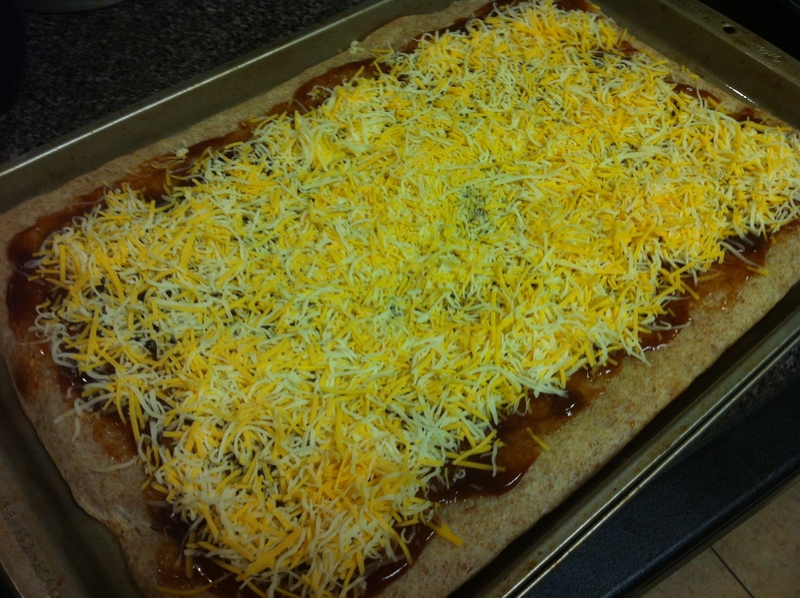 After a few minutes take out the baked dough and cover it with some BBQ sauce and shredded cheese. 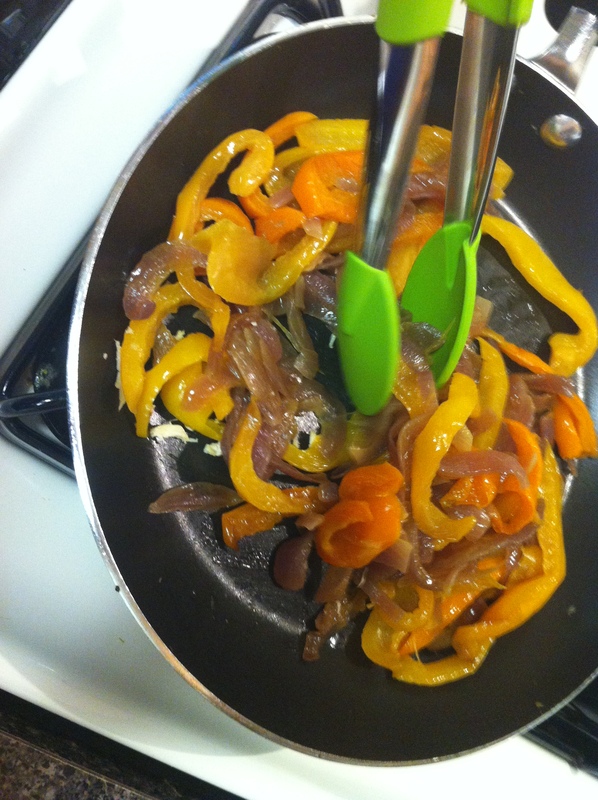 And top with the onions and peppers. 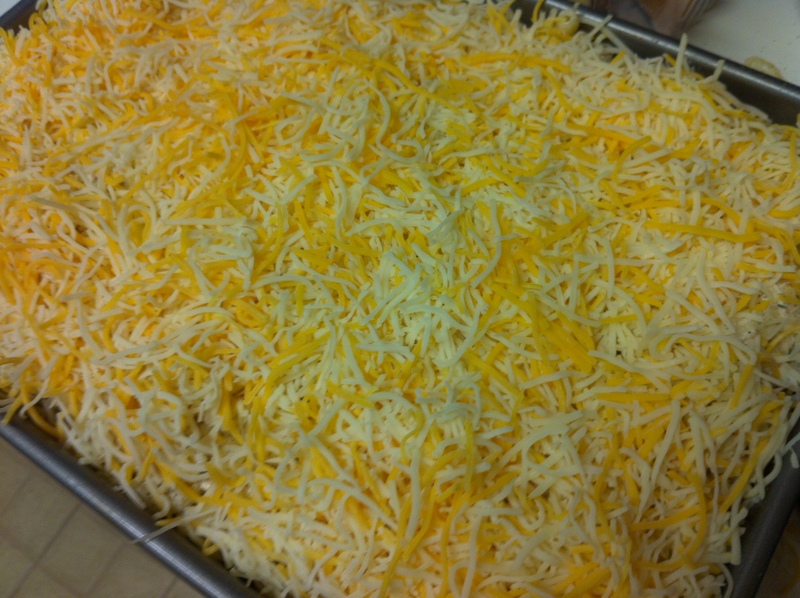 Put it back in the oven until the cheese is melty and delicious. 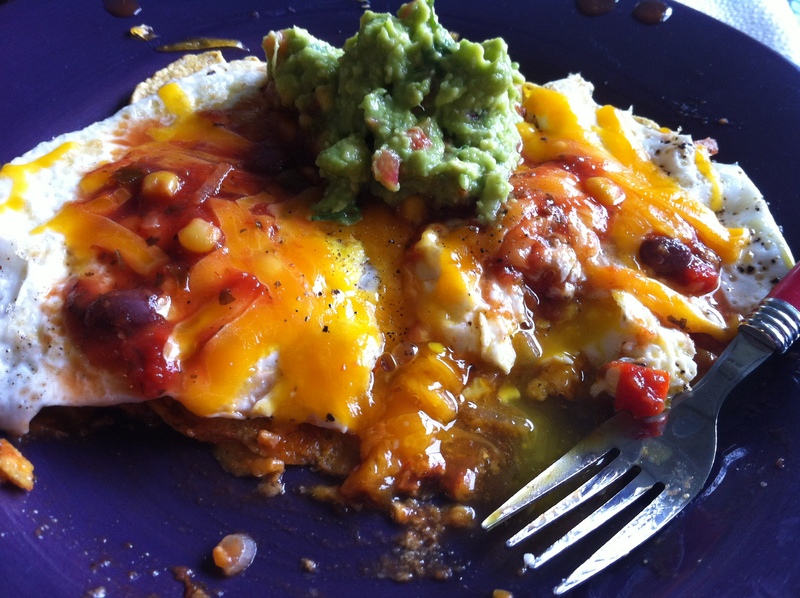 Two of my favorite food genres (yes I describe food in genres) are Mexican food and breakfast food, so Mexican breakfast food is pretty much the perfect food combination in my mind. 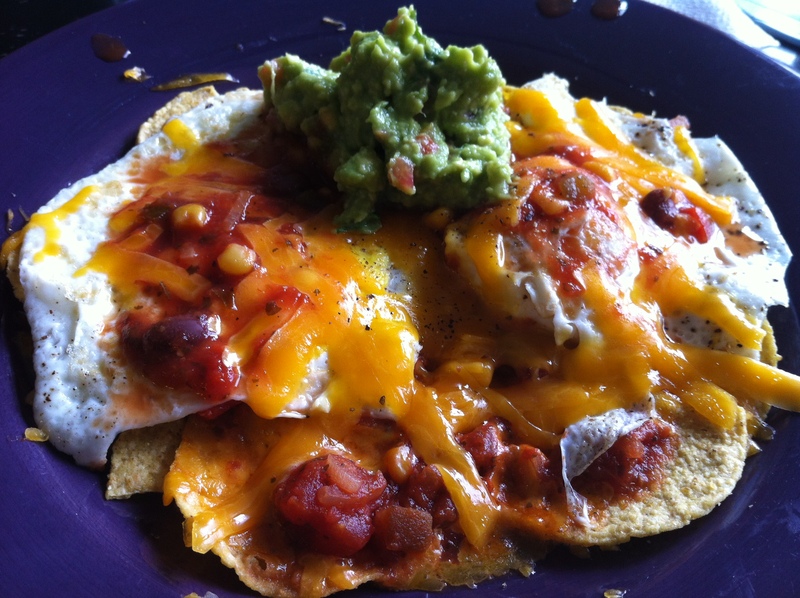 A few months ago I had a craving for Mexican breakfast food so I looked around the cupboards and my house to see what I could make. 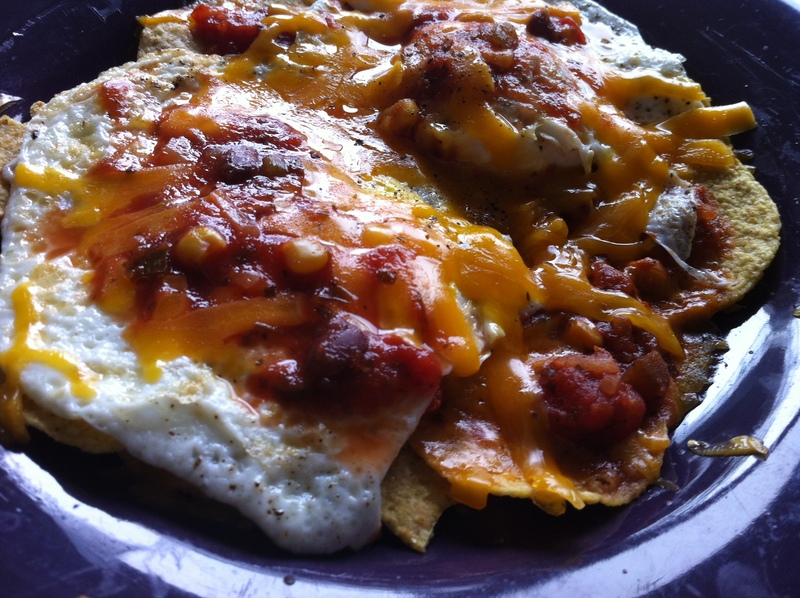 I came up with these super easy huevos rancheros that turned out to be a delicious combination of slightly crispy tortilla chips, tangy salsa, melty cheese, and hot eggs, they’re now a regular on my breakfast menu! 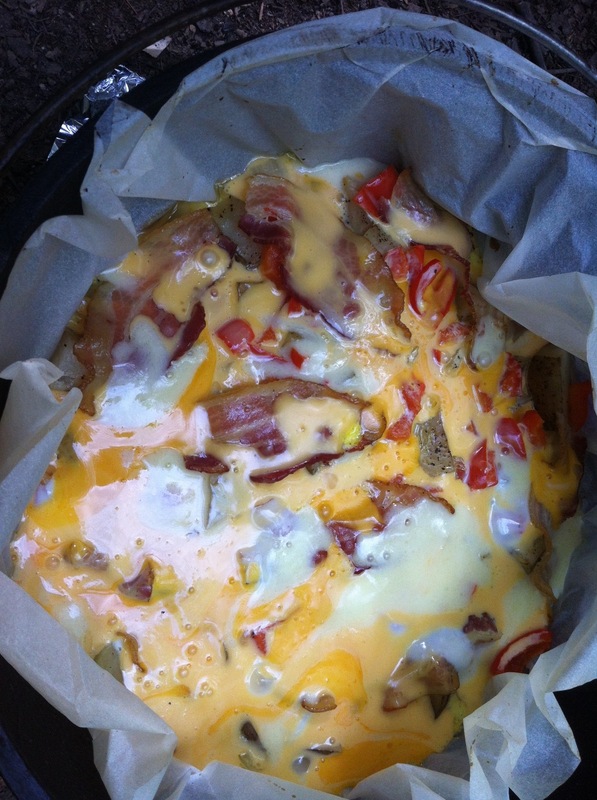 I started by making some microwave nachos, I used to make these all the time as an after school snack. 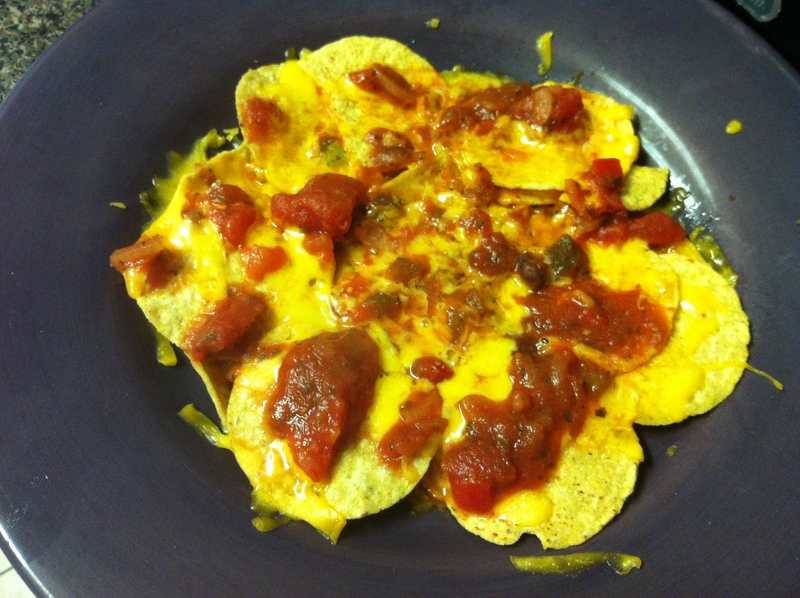 Spread some tortilla chips on a plate, top with salsa and shredded cheese, and pop them in the microwave. 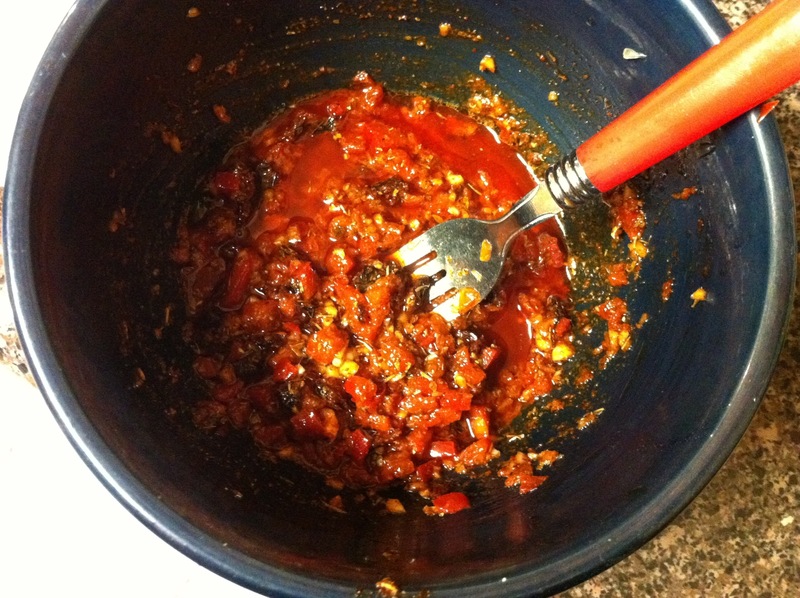 You can use any kind of salsa you want, I like to use jarred southwest salsa since it has black beans in and and the jarred salsa tends to have more juice than fresh salsa. Then you fry some eggs to your liking, I usually go with over easy to over medium. 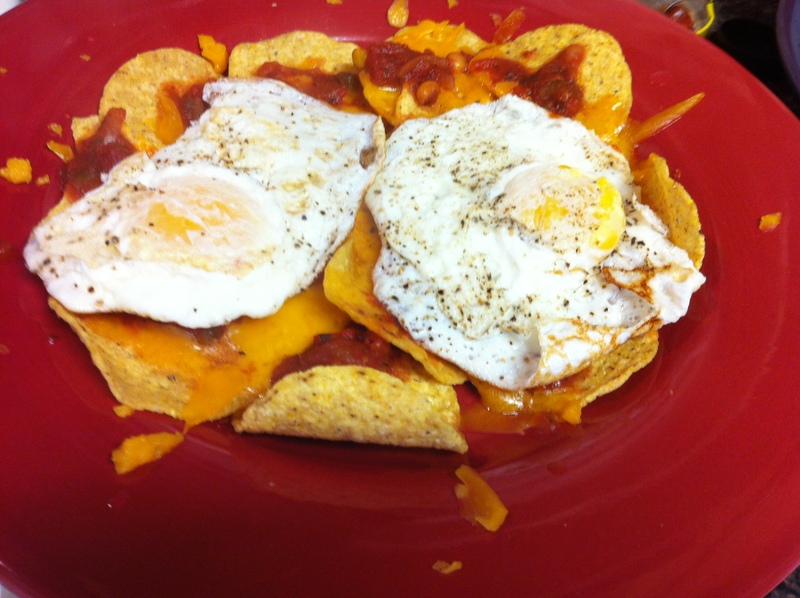 Place the eggs on top of the nachos. 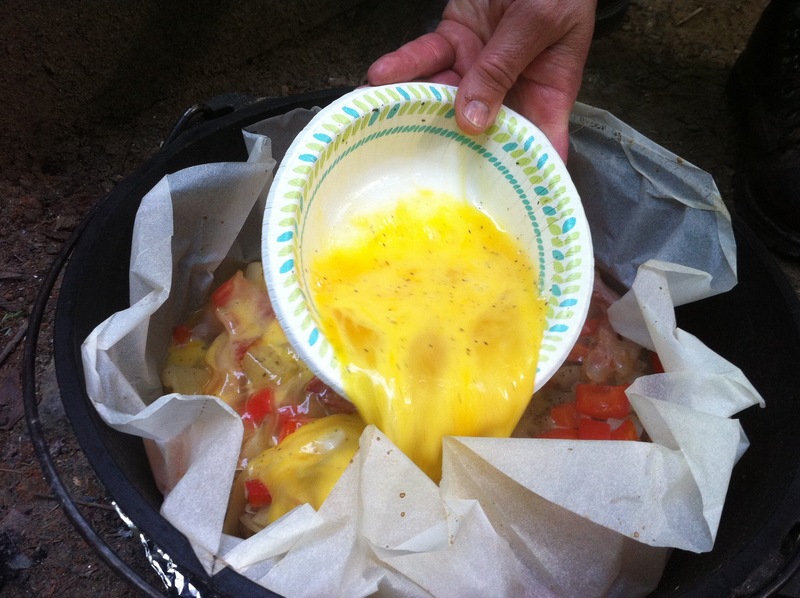 Top the eggs with more salsa, then shred some cheese on top, cover with a pan lid and let sit until the cheese melts. 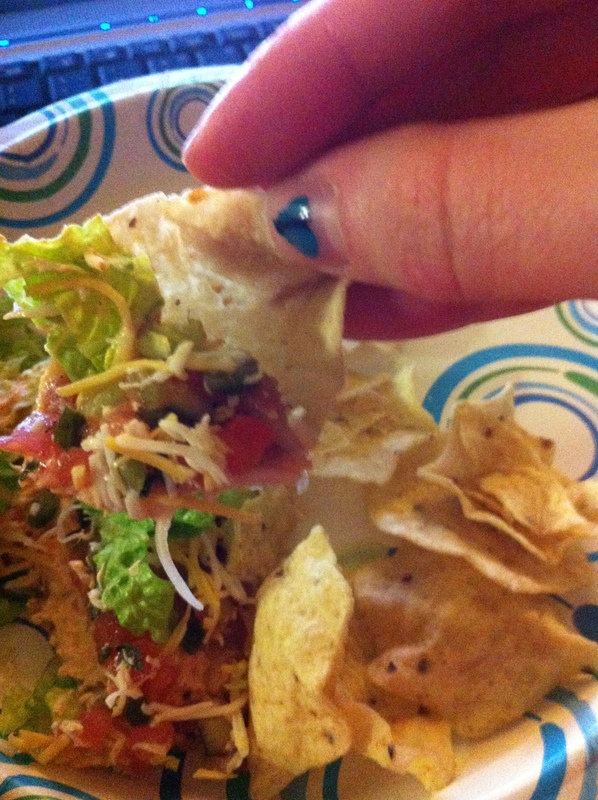 Serve with guacamole as you like. 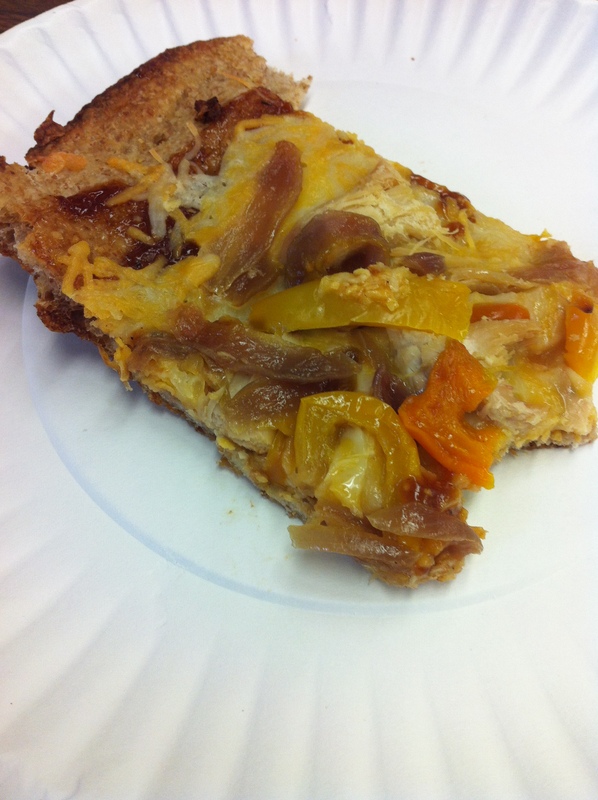 I’ve seen various recipes for pizzas using vegetables as a crust floating around pinterest and other random corners of the internet for the past few months and was always intrigued by the idea. 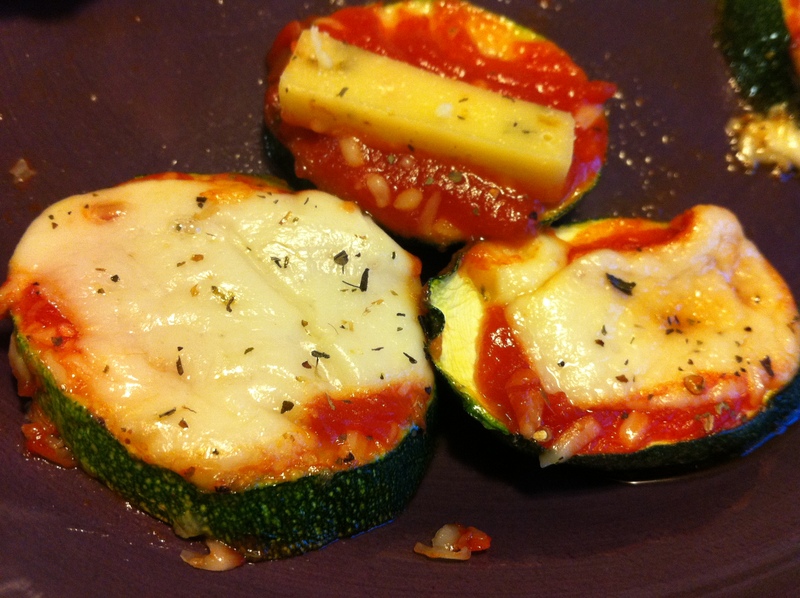 When I visited home a few weeks ago and found some delicious zucchinis and squash I knew I wanted to try making pizza with them, it turned out great! We made traditional pizzas with tomato sauce and mozzarella and we also tried using pepper jack cheese (which ended up being AMAZINGLY good) as well as some pesto pizzas. 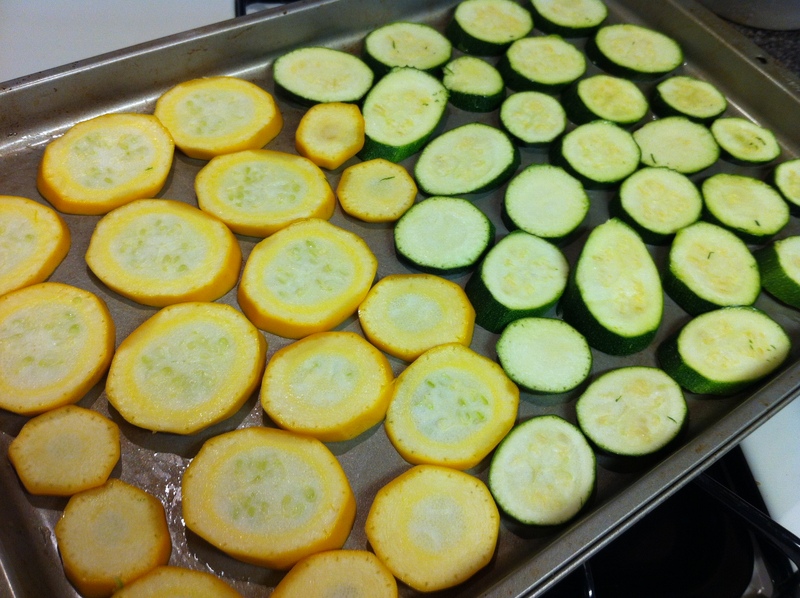 First slice up some zucchini and squash into 1/4″ thick slices and lay them on a greased baking sheet. 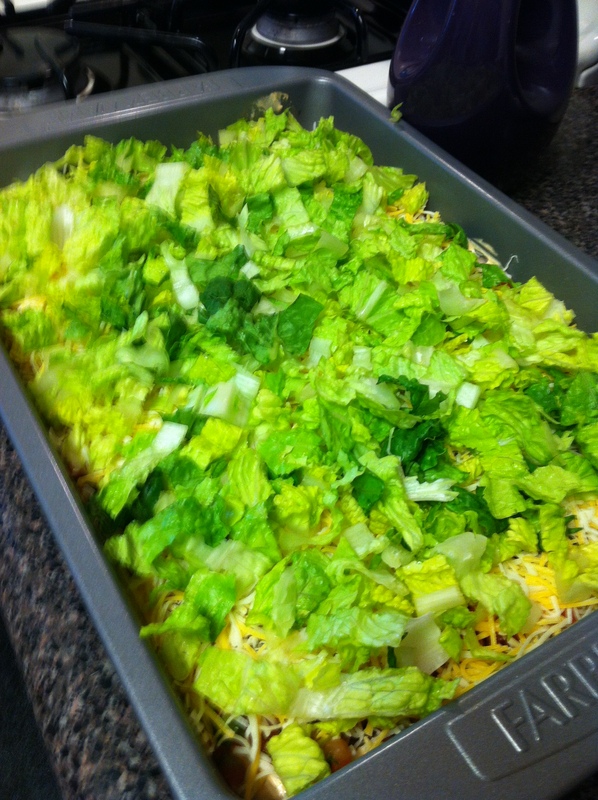 Put them in the oven and bake for a little. 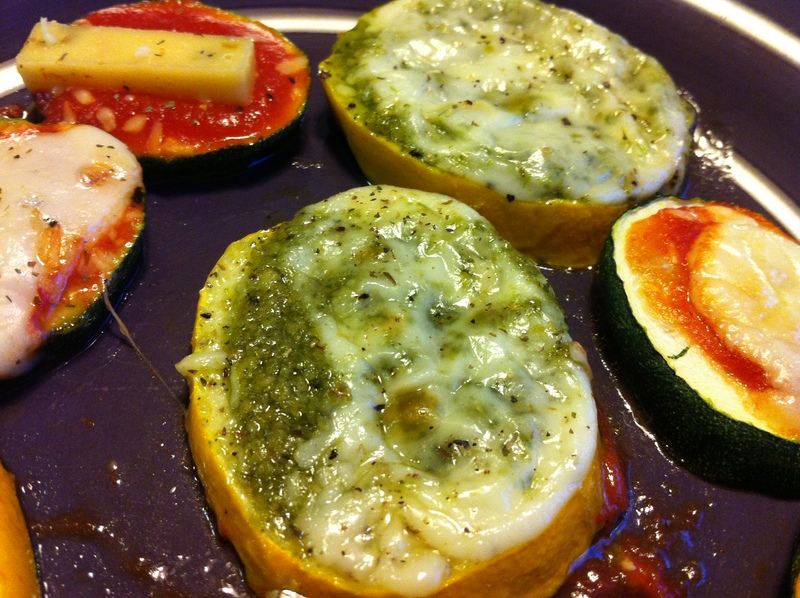 Then take them out, cover them with your desired sauce (tomato or pesto), and add cheese. We also topped ours with some dried Italian spices (basil, oregano, and parsley) and some fresh ground black pepper. 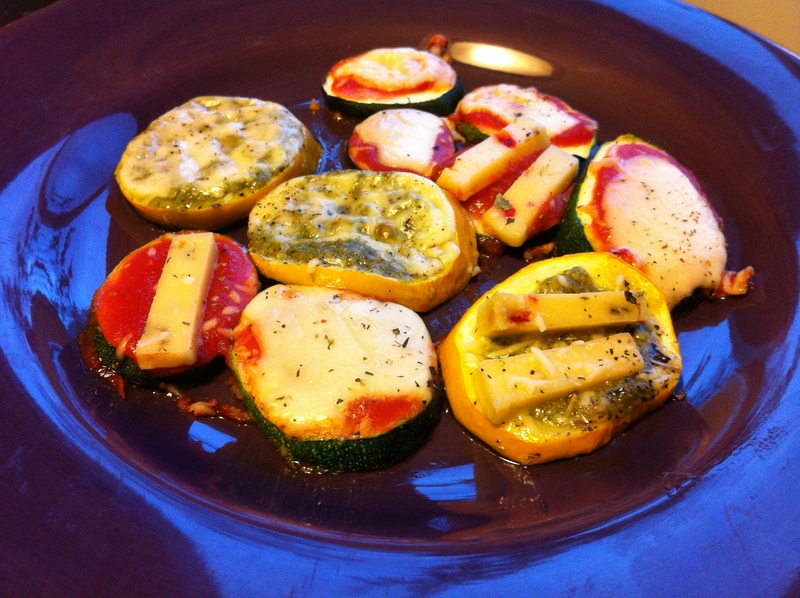 Return them to the oven until the cheese is bubbly and gooey and delicious. 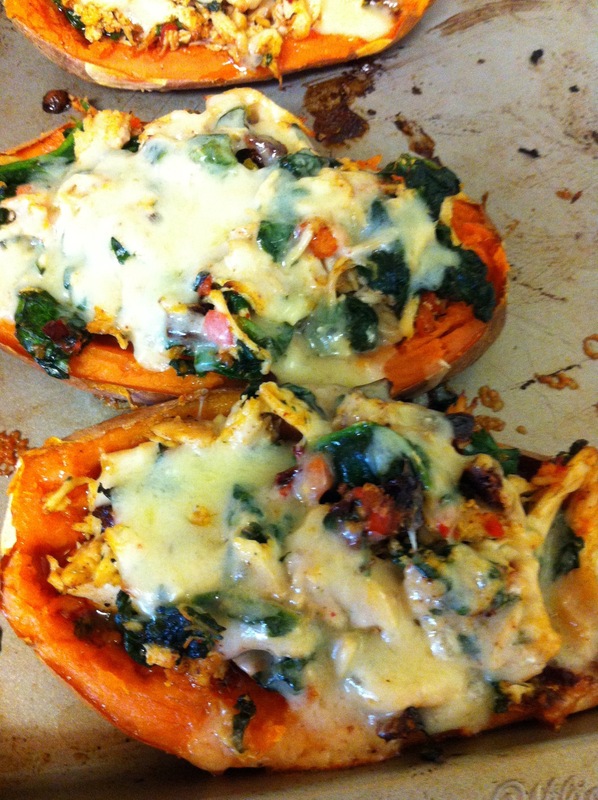 Then serve them up on a plate and enjoy! They’re kinda like bagel bites, but healthier. My dad absolutely loves cooking outdoors, be it on a grill, over a fire, using charcoal with the dutch oven, you name it, he does it. 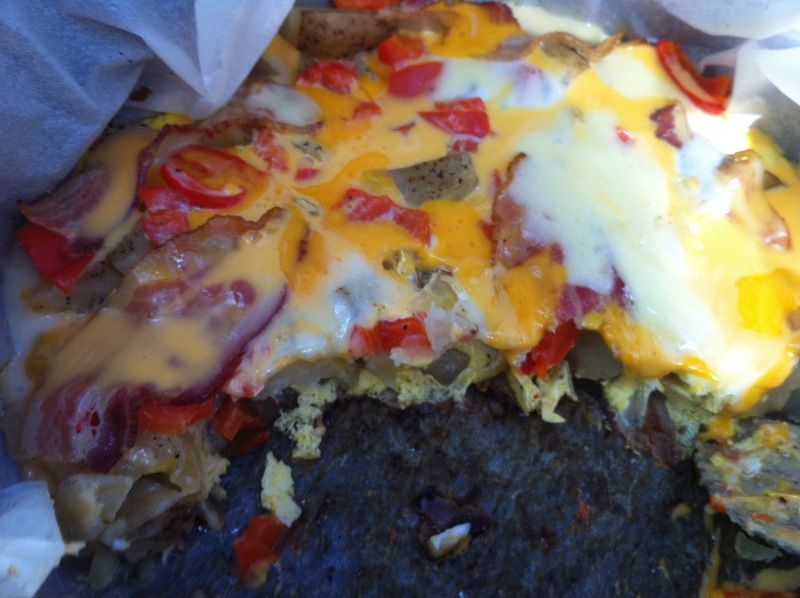 One of his signature dishes is his breakfast casserole. He makes it on holidays and every time we go camping. 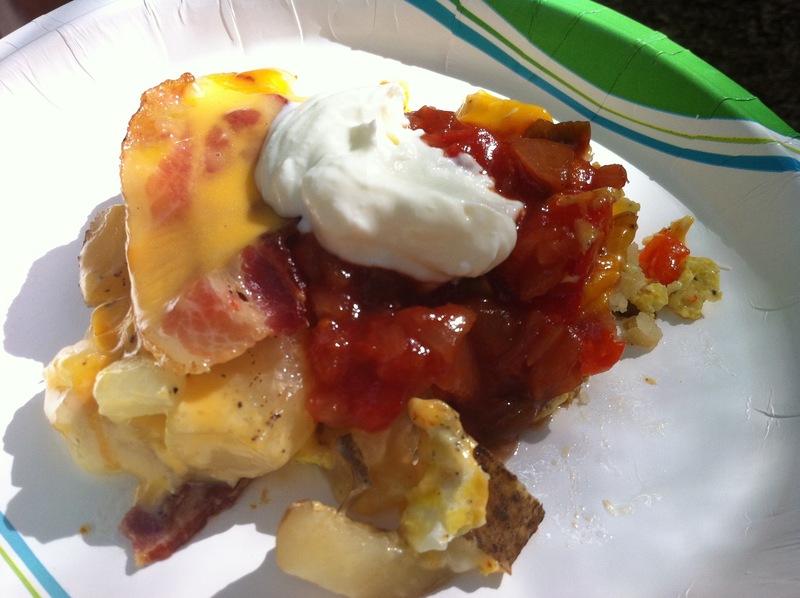 I LOVE breakfast foods, and this casserole combines potatoes, eggs, bacon (a necessity for any breakfast if you ask me), and cheese, it’s pretty delicious! 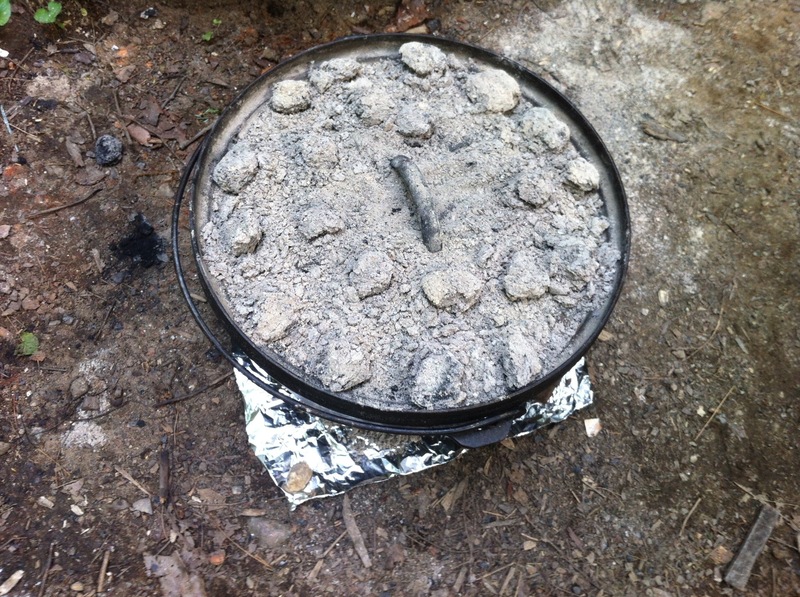 Put the lid on and sit the dutch oven over some coals, making sure the coals aren’t actually touching the bottom (this causes hot spots and uneven cooking), then add more on top. 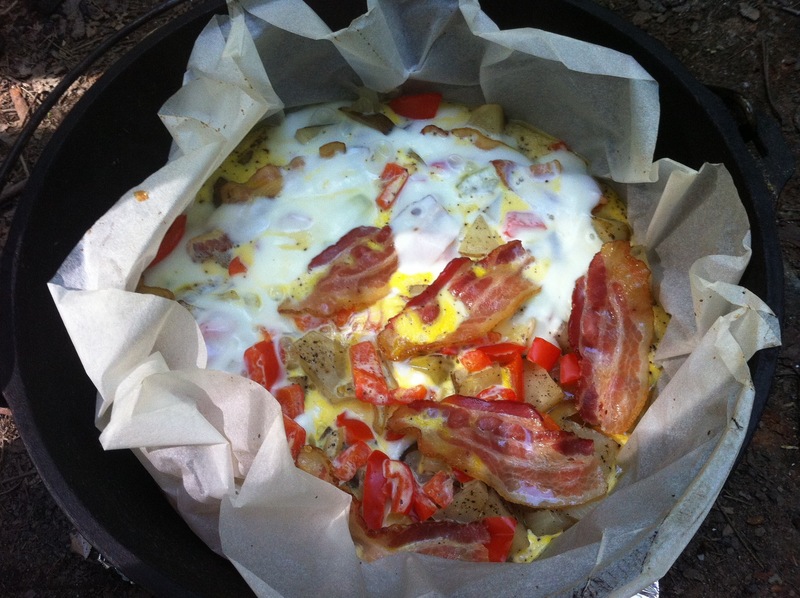 You’ll need to rotate the dutch oven 90 º and the lid 90 º in the opposite direction every 10-15 minutes. 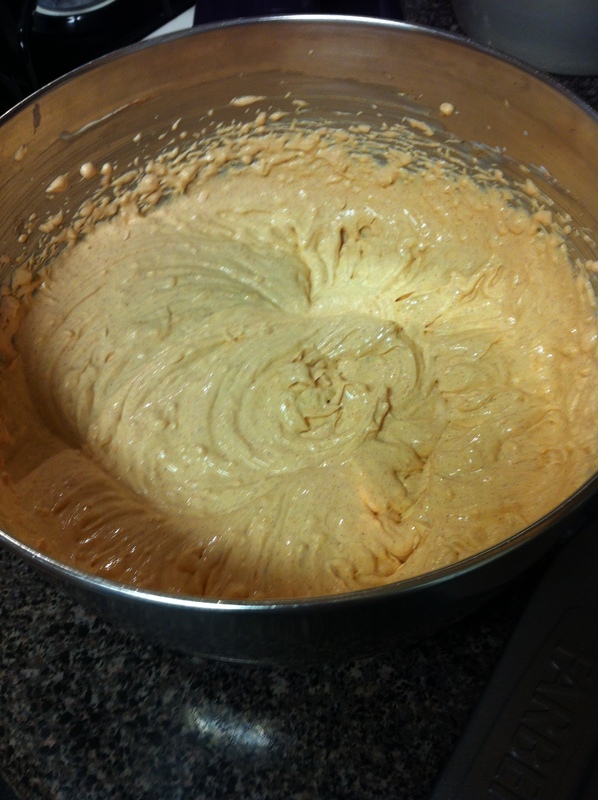 After about an hour and a half add in some eggs. Sprinkle on some cheese and cover again for a few minutes until the cheese is melty and delicious. 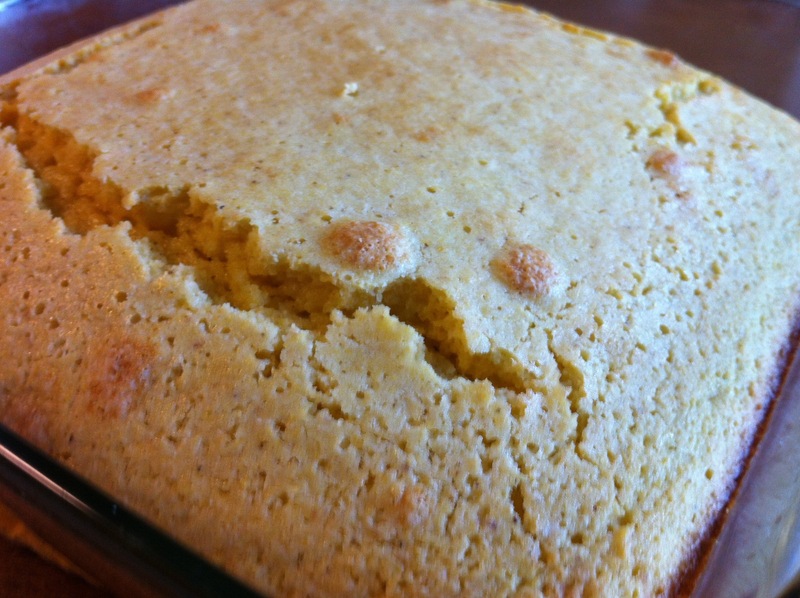 Look at the gooey goodness! 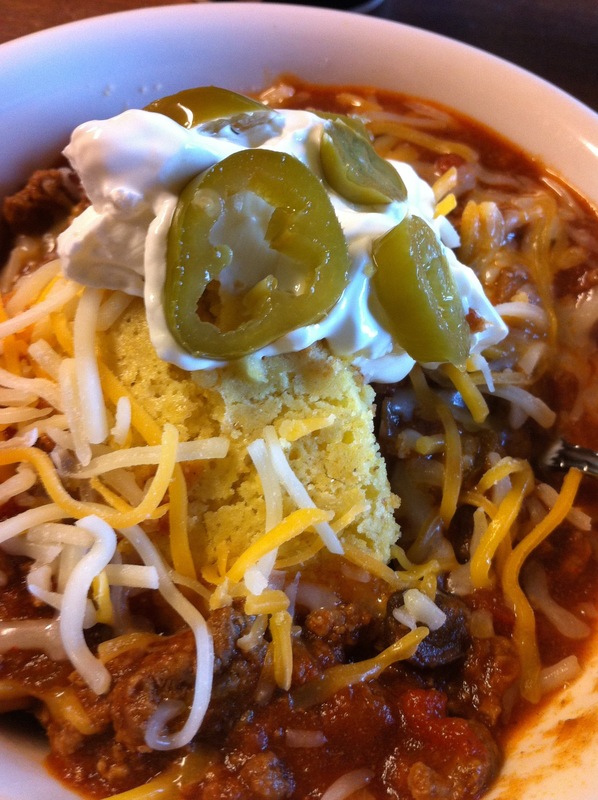 Serve it up on a plate along with some sour cream and salsa. 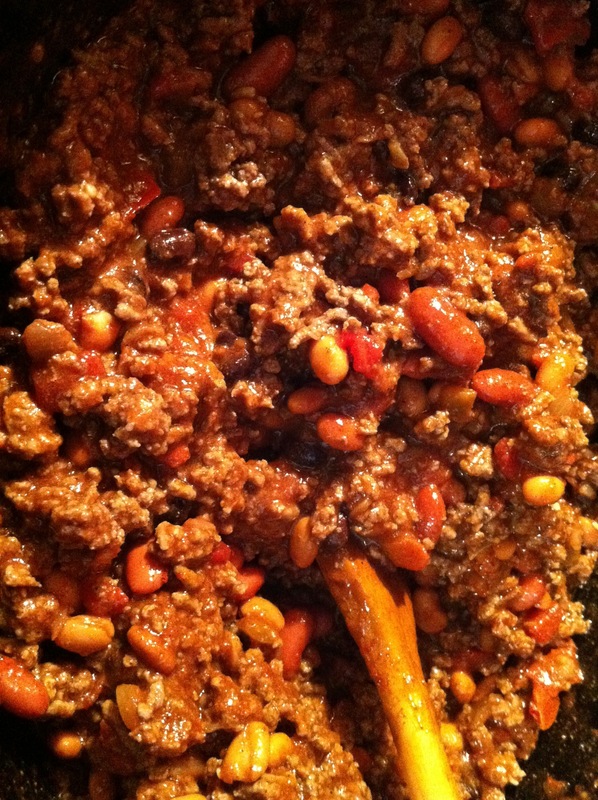 – Prepare coals/embers (you can also make this in the oven, in which case you’ll need to preheat the oven to 325 ºF). I’ve mentioned before that I have an obsession with pinterest. 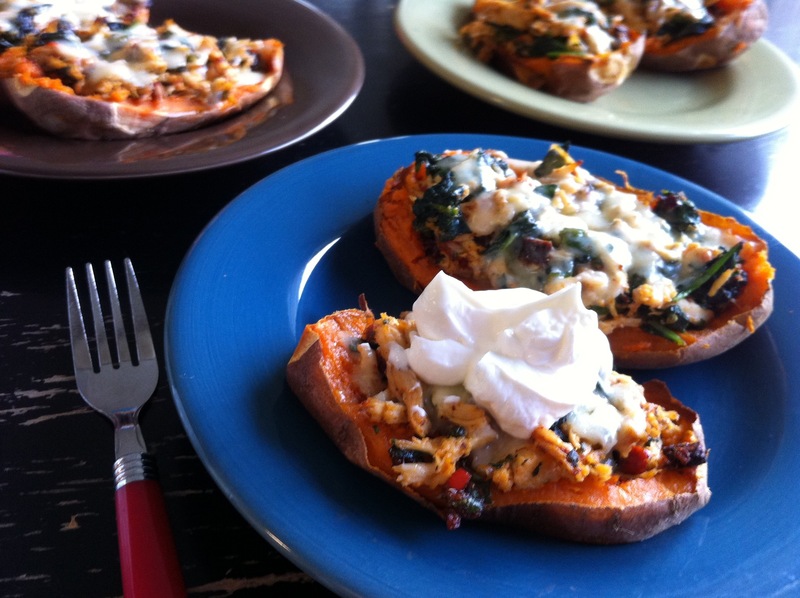 If pinning something magically made it appear in your closet/kitchen/backyard I would be one happy girl, but since that isn’t going to happen anytime soon, my roommate and I made these delicious Chipotle Chicken Sweet Potato Skins from Half Baked Harvest (check out the blog, it’s awesome!) appear in our kitchen the old fashioned way, by cooking them ourselves. 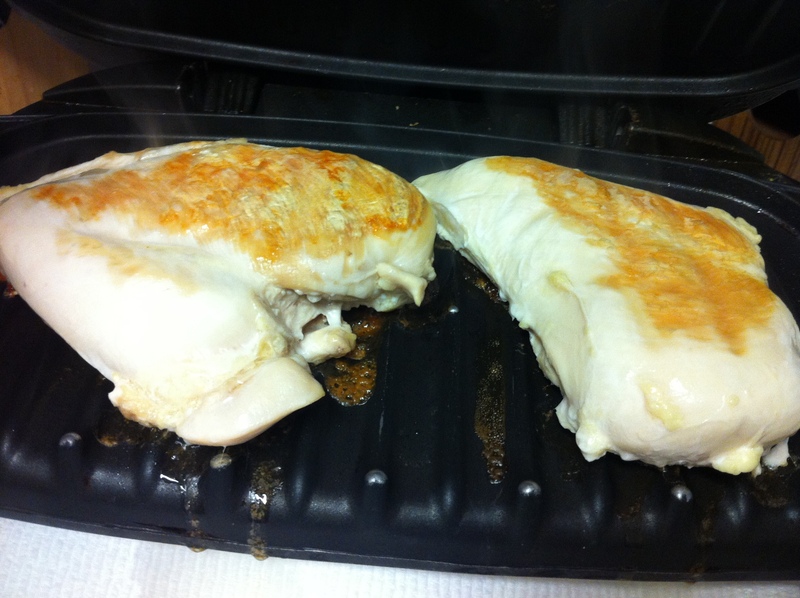 First, cover your chicken with some olive oil, salt & pepper, and bake it in the oven along with some sweet potatoes. 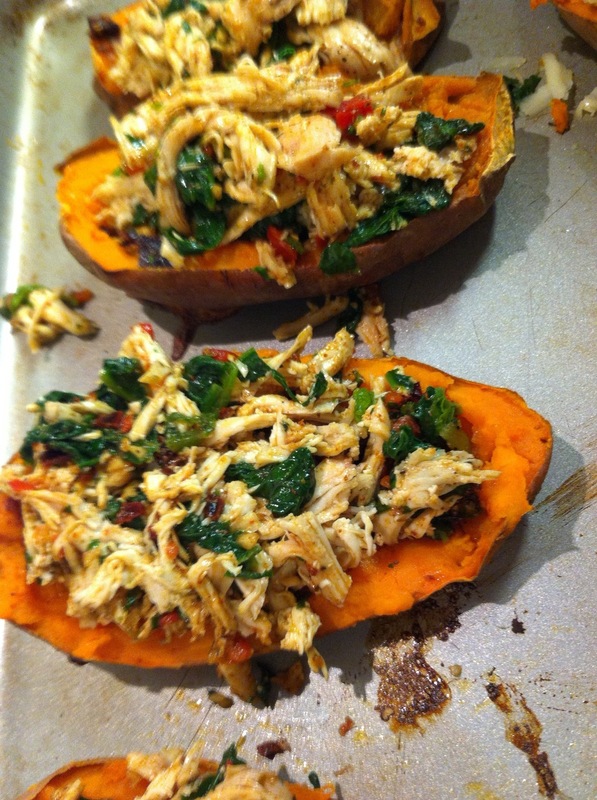 While the chicken and sweet potatoes are baking, wilt some spinach in a pan. Mix up your sauce by mincing some dried chipotle peppers, a red bell pepper, and garlic, then combine it with olive oil, fresh lime juice, oregano, chili powder, salt & pepper, and fresh cilantro. 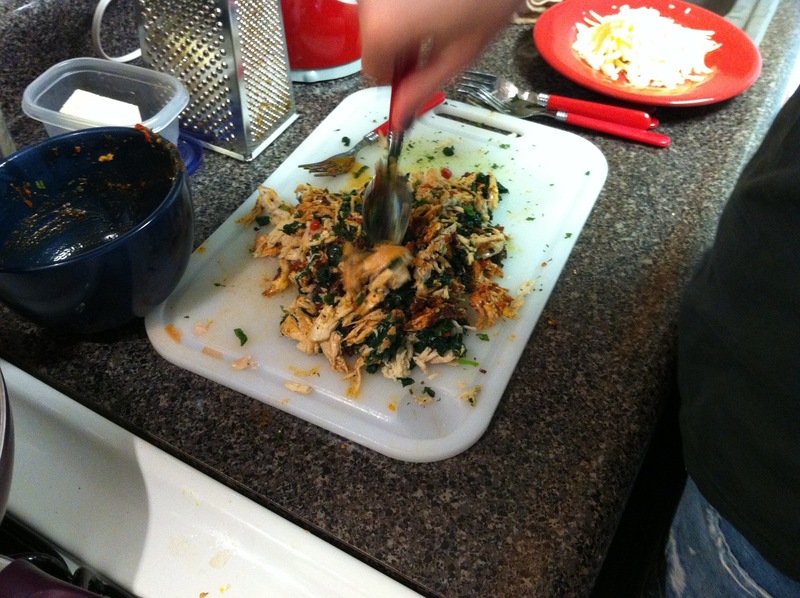 When the chicken is done shred it and mix it with the wilted spinach and about 3/4 of the sauce. 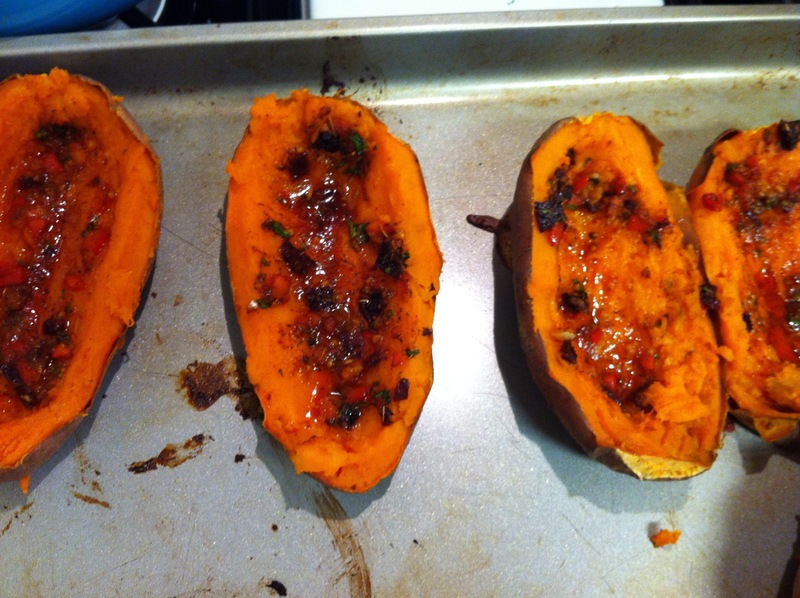 After the sweet potatoes are tender cut them in half and scoop our the insides so that there’s a small layer of sweet potato left (enough so the skins don’t collapse). 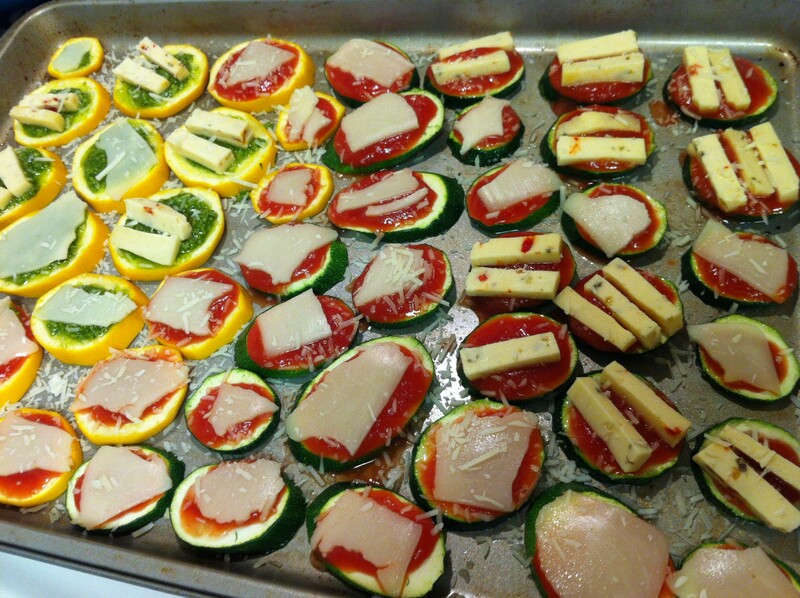 Then brush some sauce into each skin and return them to the oven. Your kitchen will smell absolutely amazing at this point, you’re going to wish you could speed up time and eat the finished product! 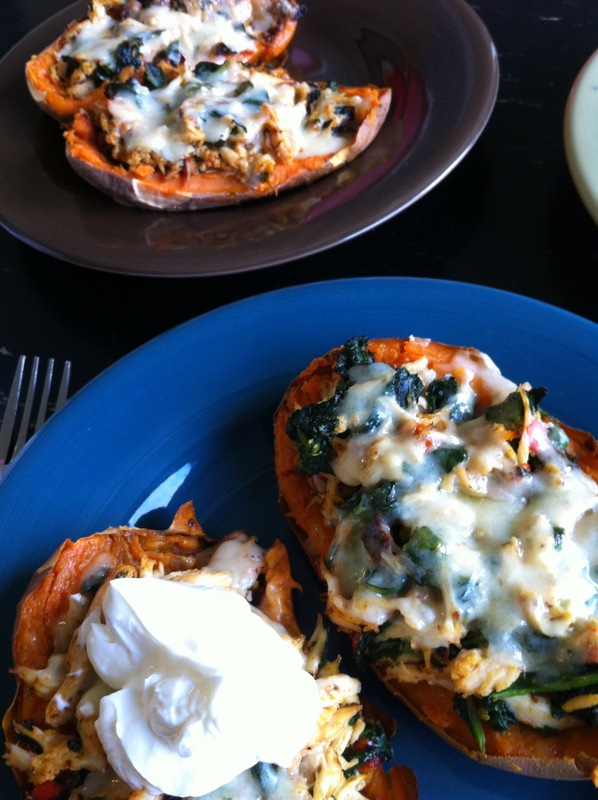 Spoon the chicken/spinach/sauce mixture into the sweet potato skins and top with some grated sharp cheddar cheese. 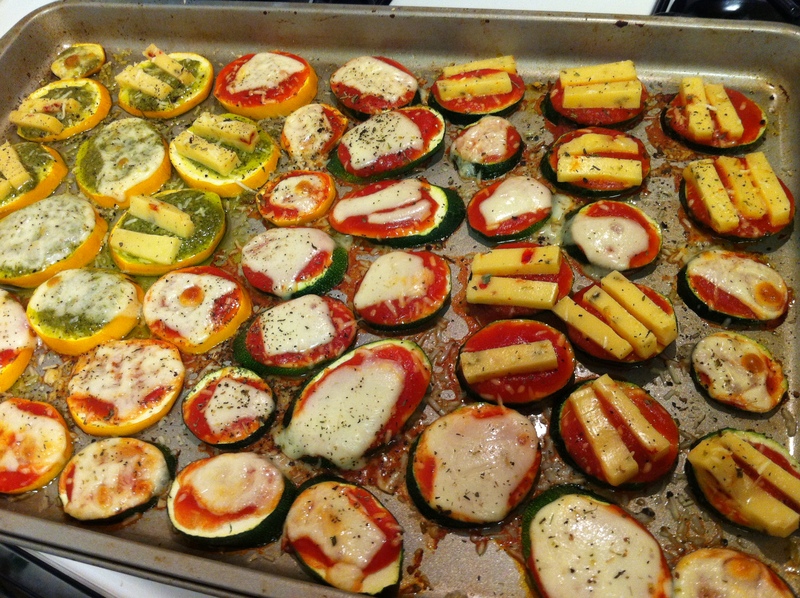 Return them to the oven to melt the cheese. 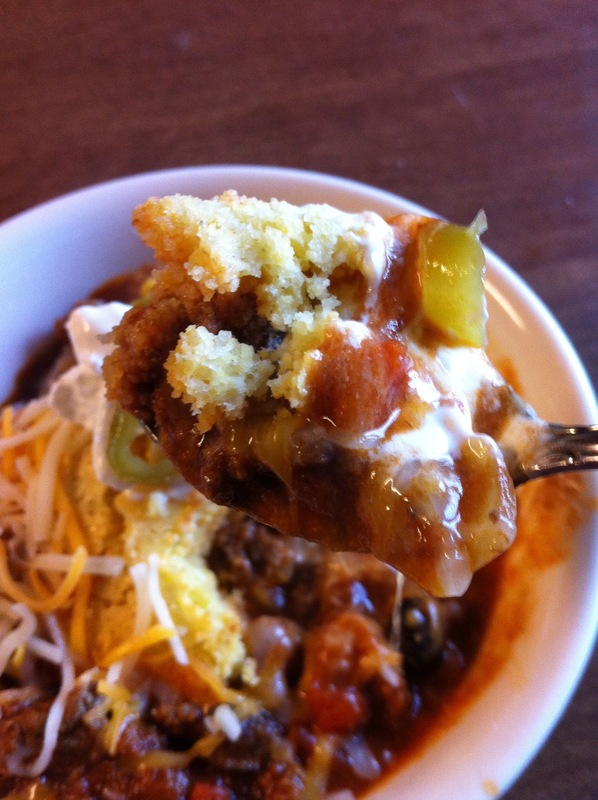 Serve them with some sour cream (because sour cream makes EVERYTHING better). 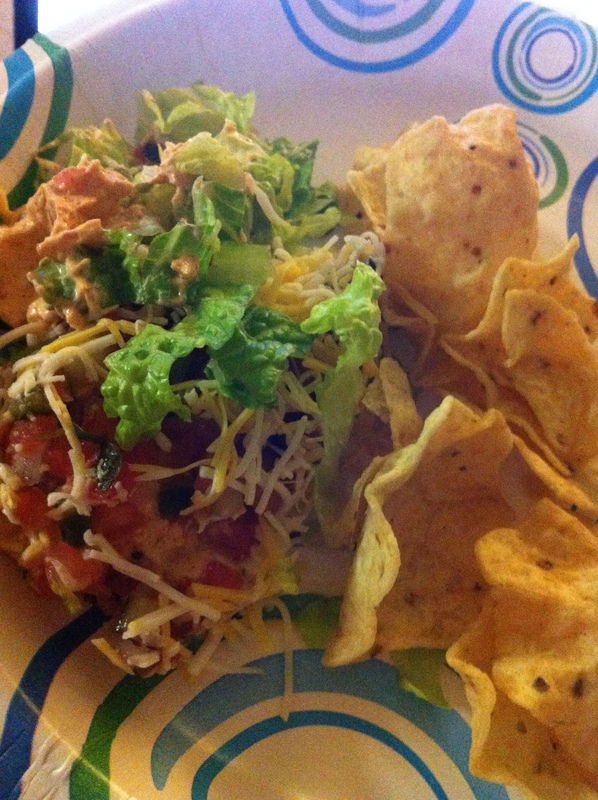 Soooooo delicious!